G.R.P. (Glass Reinforced Polyester) garage doors are quite simply the best doors that you can buy. G.R.P. has a better strength to weight ratio than steel, is a natural insulating material, it won't warp, shrink or rust and is virtually maintenance free. Wessex GRP doors are tested to, and exceed, the same stringent impact resistance requirements as those stipulated under BS6206:1981 as it applies to Safety Glass and Safety Plastics for use in critical locations in buildings, thereby confirming and guaranteeing the toughness of the product. 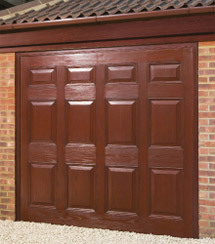 GRP is probably the ultimate material from which to manufacture a garage door. G.R.P. can be moulded in smooth gloss finishes or with a stunningly life like Woodgrain finish, using moulds taken from real high quality solid timber door designs to give an authentic and faithful finish to your garage door that will even deceive the experts. GRP doors are manufactured by skilled laminators and finishers in our Birmingham factory were each door is built to order. Unlike mass produced 'synthetic' machine applied finishes, Wessex timber effect doors replicate nature in that, when completed, no two doors are ever identical, each having been built and finished by hand. One further significant feature of GRP is its' ease of repair. Should a door panel become scratched or damaged, GRP, more than any other material used in garage door construction, is easily and effectively restored leaving a repair that would pass the closest inspection.